All interior décor ideas involve a bit of painting. Everything, from choosing the right colors to hiring the best interior painting contractor, goes a long way into ensuring that you complete your project successfully. You might have to spend hours studying color pallets, swatches, and patterns before coming up with the ideal décor. The cost to paint an interior will vary depending on a number of factors. We’ve gone through some of the most significant factors to help you make a decision faster. If you want to handle the painting on your own, you will have to buy paint and painting tools. Paint can cost you anywhere between $15 - $30 per gallon depending on the quality and finish you would prefer. Flat finish paints are great for hiding blemishes and are cheaper while vibrant gloss finish paints, though expensive, are washable hence more economical and easy to maintain. It's important to keep in mind that the cost to paint an interior room can vary by room type. A smaller room can cost more to paint based on the type of paint required and the number of coats. The bathroom or living room is a good example of this factor too. Kitchens would require less paint than a bedroom of the same size due to more wall area being covered by kitchen cabinets. Click here for some tips on how to choose the ideal interior paint finish. Once you have your paint, you’ll then have to choose between brushes and rollers. Rollers are cheaper but tend to have a shorter lifespan. If you use a roller, be sure to buy lint-free roller heads as cheap paint roller covers tend to leave a bit of fuzz on the wall. Your brushes, on the other hand, will range between $17 - $22 depending on brush bristles, but cheap brushes tend to leave streaky marks. It's worth paying a few extra dollars here. When hiring a professional, expect to spend anything between $25 - $100 per hour on labor, depending on your region and the complexity of the job. Moving furniture and other prepping costs may not be included in their initial estimate, so be sure to enquire about it. Equally, if your walls are higher than 8ft or you have some crown molding, baseboards, wainscoting or other detailed interior painting work, contractors could charge extra. 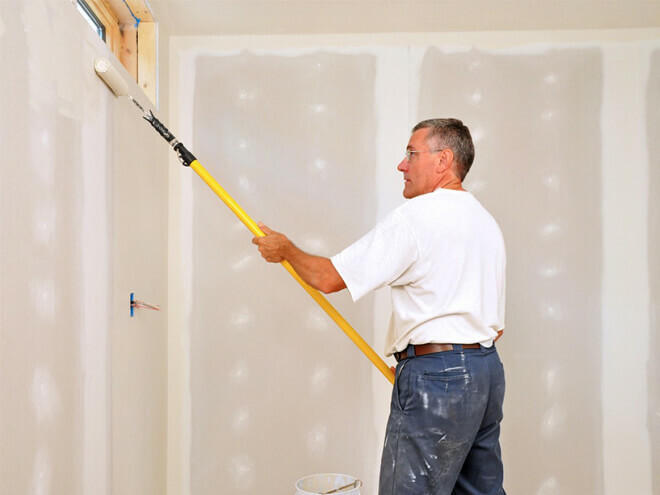 Professional interior painting contractors offer a better quality job. They will take a shorter time to complete the project and know how to deal with any defects better than a DIY enthusiast. Any specific contractor will base his or her per hour rates on the complexity of the job and any design flaws or features that will make the job harder. The current condition of your walls. You will pay more to repair any blemishes before beginning the painting. Does the wall need scraping and sanding before the painting? If yes, you will spend more time and money on the project. Are there any additional permits needed to handle a major painting project in your region? What Is The Overall Cost To Paint The Interior Of My Home? The biggest variant would be whether you choose to do the interior painting yourself or hire a professional. Hiring professionals generally guarantee a faster, high-quality finish, but it will cost more. For most American homeowners the average cost to paint interior comes in at around $1,700, but you can expect to spend as little as $400 for simple small room painting projects and as much as $4,500 for bigger projects done by professional painting contractors. Comparing a couple of quotes from multiple contractors will help you put a more accurate value on your painting project. You will also have to inspect a couple of warehouses and check out the paint prices as this is what will take up a large part of the overall cost. Using a good painting contractor will ensure a higher resale value for your home. You can get a FREE quote from a local professional on the cost to paint an interior. Simply enter your home zip code in the space provided on this page below to reach out to a professional near you. There's absolutely no obligation to purchase, hire or sign any contracts. Interior painting quotes are 100% FREE and a great way to decide what's possible given your budget. The cost to paint your home's interior will vary depending on your region, the paint you use, and other factors. Get in touch with a local professional for a more accurate idea of what you will be paying.